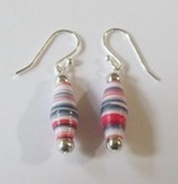 Our new paper bead jewelry is lightweight, colorful, elegant and affordable. We currently have designed a line of bracelets, necklaces, and earrings. However we will have more designs coming soon. For special made colors combinations and designs go the request page, and we will get back with you shortly.